Heredity: The passing of traits from the parents to offspring is called heredity. This is heredity which is responsible for many commonly observable facts; like siblings looking similar in overall appearance. Phenotype: The observable characters in an organism make the phenotype. Phenotype is a result of genotype’s interaction with the environment. Due to this reason, many phenotypes are not inheritable. Acquired Traits: Traits; which are acquired due to interaction with the environment; are called acquired traits. Acquired traits are not inheritable. For example; if a boxer develops bulging biceps, it does not mean that his son would be borne with bulging biceps. Inheritable Traits: Traits; which can be expressed in subsequent generations; are called inheritable traits. Such traits bring a change in the genotype of the organism and hence become inheritable. Asexual reproduction involves a single parent and is hence not ideal ideal for facilitating variations. Some minor variations do occur due to inaccuracies in DNA replication. But the quantum of variations would be too little and would take too many years to show effect. Gregor Johann Mendel conducted experiments on pea plants and proposed the rules of inheritance; based on his observations. Mendel observed that characters are often present in pairs. A pair of contrasting characters is called allele. Pea can be termed as biennial plant, i.e. two generations of a pea plant can grow in a given year. This means that Mendel could get enough time to observe a larger number of generations. Monohybrid Cross: The cross in which just two contrasting characters are studied is called monohybrid cross. Mendel did monohybrid cross for his first experiment. He selected a pair of contrasting characters for that experiment. Let us take the example of cross between tall plants and short plants. The figure; given here shows the results of this experiment. TT represents the genotype of tall plant and tt represents the genotype of short plants. In the F2 generation, all plants were tall but their genotype was Tt; which means they were not pure tall plants. This could be established by the appearance of the character of shortness in the F2 generation; in which most of the plants were tall and some of the plants were short. This experiment showed that the character of shortness of recessive in F1 generation and hence could not be observed. 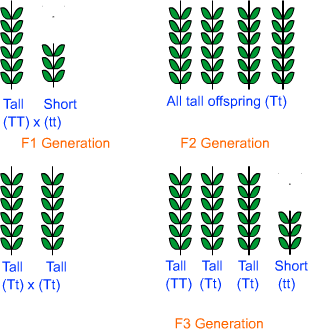 The ratio of number of tall plants to that of short plants in F2 generation was 3 : 1. Dihybrid Cross: The cross in which two pairs of characters are studied is called dihybrid cross. In his second experiment, Mendel used dihybrid cross. Let us take example between plants with round and green seeds and those with wrinkled and yellow seeds. The genotype of round and green seeds is shown by RRyy and that of wrinkled and yellow seeds is shown by rrYY. In the F1 generation, all plants produced round and yellow seeds; which means that wrinkled texture was the recessive character and so was the green colour of seeds. When plants of F1 generation were allowed to self pollinate; it was observed that most of the plants in F2 generation produced round and yellow seeds. Some plants produces round green seeds, some produced wrinkled yellow seeds and some produced wrinkled green seeds. The ratio was 9 : 3 : 3 : 1; as shown in the figure. In the above example; alleles of texture were assorted independently from those of seed colour. Somatic cells in human beings contain 23 pairs of chromosomes. Out of them the 23rd pair is composed of different types of chromosomes which are named as X and Y chromosomes. The 23rd pair contains one X and one Y chromosome in a male. On the other hand, the 23rd pair in a female contains X chromosomes. 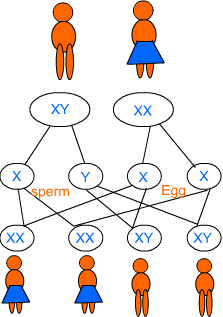 This means that all the eggs would have X chromosome as the 23rd chromosome, while a sperm may have either X or Y chromosome as the 23rd chromosome. When a sperm with X chromosome fertilizes the egg, the resulting zygote would develop into a female child. When a sperm with Y chromosome fertilizes the egg, the resulting zygote would develop into a male child.